Seletar was the first aerodome commissioned by the RAF in Singapore in 1930. It was the main base for the RAF in the Far East and considered by the Japanese as the best in Southeast Asia. The airbase had seaplane facilities and it was a Catalina Flying Boat of the 205 Squadron based at Seletar that tracked the Japanese Convoy in the South China Sea on its way to Malaya on 7 December 1941. However, it was shot down before it could file a report, rendering it the first casualty of the Pacific War. At the onset of the war, Seletar operated three squadrons comprising Vildebeeste biplanes and Catalinas. 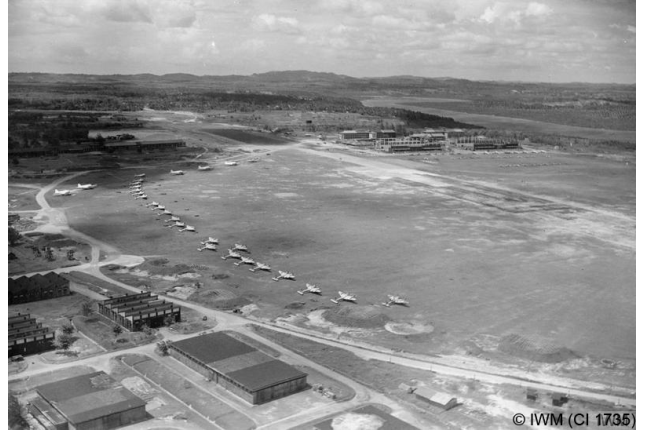 Seletar airbase suffered much incursions such as being hit by five heavy bombing raids in January 1942 as well as daily raids in the month of February in the same year. On 26 January, fighters and bombers from Sembawang and Seletar carried out a raid on a Japanese troop convoy heading towards Endau in Johore. They failed to stop the Japanese landing there and wound up suffering heavy losses instead. Almost all RAF personnel were pulled out of Singapore by 11 February and the Japanese took control of the Seletar airbase on 14 February. When the tide of battle turned later in the war., the Allies started to hit back. In October 1944, American B-29 Bombers attacked Seletar. After the war ended, the airbase was returned to the British. It was then handed over to the Department of Civil Aviation in 1968. Today, various flight schools operate from Seletar.